When you’re in Spotify, click the People link on the left-hand side to display a list of all your Facebook friends (as well as Spotify profiles you’ve manually added) in the main pane. 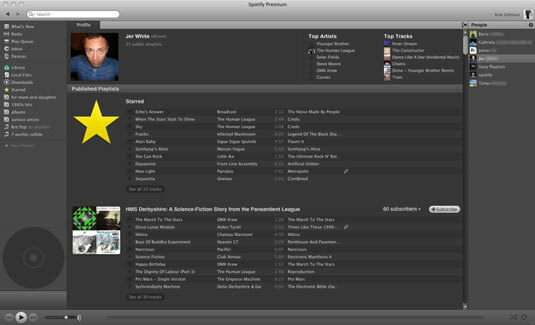 In this main view, click On Spotify to only display profiles of people who have Spotify installed. Click a name in this list to bring up his public Spotify profile. From there, you can scroll down your friend’s page to see all his playlists. When viewing a list of all your friends in the main pane, hover over a profile name and click Add to Favorites to conveniently add their name to the right-hand pane. Browse all the playlists on a profile page by clicking and dragging the main pane’s scroll bar downward, or by clicking within the profile page and then using the scroll wheel on your mouse to whiz down (especially if your friend has a lot of playlists!). In older versions of Spotify, you could sort playlists by title, length, or number of subscribers, and in both ascending and descending order. The latest version of the software doesn’t have this feature, which is a little inconvenient if your contact has dozens of playlists you have to sift through. You can, however, sort a particular playlist if you click its title to select it (particularly handy if it contains hundreds of songs). You don’t have to display the People bar in your Spotify window all the time, cluttering precious room that you want to use to view your track listings. If you want to hide the People bar, click View→People list to hide/unhide the bar. On Spotify, the default setting is for Spotify to automatically publish all the playlists you’ve created until you go in and edit your profile. Spotify says this approach is easier for you than making you manually publish all your playlists.